The next Redway Runners beginners’ groups are starting after Easter 2019 and at the end of the course you will take part in the free Milton Keynes 5K parkrun at Willen at 9am on Saturday 6 July 2019, so do put this date in your diary for graduation. Details of the courses are below, the courses are free, but you will need to be a Redway Runners member (membership is just £5). To join, click here once you have joined, in your on-line profile, select ‘events’ then beginners course and the course you wish to attend. 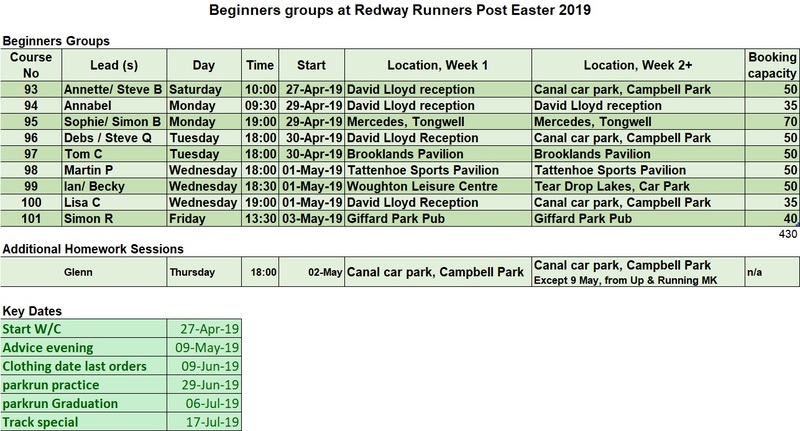 If you are already a member just log in to your Redway Runners account, click here and select ‘events’ then beginners course and the course you wish to attend. The Monday evening course will be on Tuesdays 19:00am (7 May and 28 May) from the Splash park at Willen Lake (remember to pay for parking if you use the car park. If you are thinking of signing up – have a look at some personal stories from our runners, click here and the press release for the group that graduated at the MK parkrun click here and feedback from the group that graduated in November 2017 click here. This could be you, so do not delay and sign up now. These are 10 week courses, that you need to commit to, plus doing ‘extra’sessions as homework and undertaking the free Milton Keynes 5km parkrun for the final graduation run. Can under 16’s take part? England Athletics do not recommend that children under 13 run as far as 5k and therefore our beginners courses may not be suitable for your child. The club has a under 16s section (more info click here) with an experienced coach who will use age appropriate distances for under 16s wanting to run. If you do decide you would like to bring your under 16 to a beginners or run with the club please check that the run lead is happy to take them before the run. I want to register two places on the course? I would like to attend two courses, should I register for both? I cannot attend the first week, can I still take part? Have they been held before? The first beginners course hosted by Redway Runners began on 21 Feb 2012. There have been many courses since then, hosted by a number of our run leads and on a range of different days, both during the daytime, weekends and in the evenings. How far should I be able to run at the start of the course? You don’t need to be able to run at all before the course and it is suitable for almost anyone. You will work at your own pace and build up very gradually. Please note that there should be no medical reason which would make running dangerous for you and if in doubt please ask your GP before attending. Everyone can run at their own pace, starting off with a warm up and then moving into a mixture of running and walking that will build up over the course. How far will I have to run? The sessions are usually measured over time rather than distance and the run/walk intervals build up following a plan to prepare you for the 5km parkrun at the end! The course can be between 9 and 12 weeks, and about an hour each week. To get the most out of this course, you need to be able to set aside a couple more 1-hour sessions per week, but hopefully the running bug will last a lifetime!! A pair of running trainers, some comfortable trousers, a drink and a stopwatch if you have one. If the weather is bad you will need appropriate clothing to keep you warm/dry. For courses taking place in the evenings during October to February, you are strongly advised to have small torch or head torch. At the end what can I hope for? Hopefully you will be able to complete the free Milton Keynes 5km parkrun that is held on a Saturday morning (at 9am by Willen Lake) more details on this and to register click here Remember to put your club as ‘Redway Runners’. If you are not a member, then click the join link above and join instantly on-line, once joined in your on-line profile click events, then select the course you wish to book. Anything else I should be aware? You should have a look at our runners guidelines and what happens on our runs for some general information, click here.